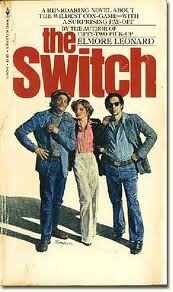 The Switch was published back in 1978. So I've had a long long time to read this book but still haven't! And living with two guys, it's not like we don't have Leonard Elmore on our bookshelves*. We do! Not sure if we have The Switch or if I'll be making a trip to the bookstore or the library though. 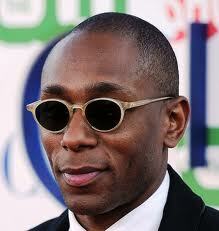 * okay, that was sexist but let's face it, Leonard isn't chicklit, right? Ordell Robbie and Louis Gara hit it off in prison, where they were both doing time for grand theft auto. Now that they're out, they're joining forces for one big score. The plan is to kidnap the wife of a wealthy Detroit developer and hold her for ransom. But they didn't figure the lowlife husband wouldn't want his lady back. So it's time for Plan B and the opportunity to make a real killing -- with the unlikely help of a beautiful, ticked-off housewife who's hungry for a large helping of sweet revenge. Jennifer Aniston would play the 'ticked-off housewife', Micky Dawson. 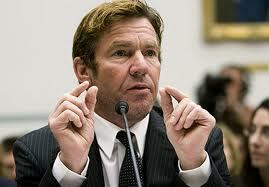 Dennis Quaid would be the lowlife husband who doesn't want her back! 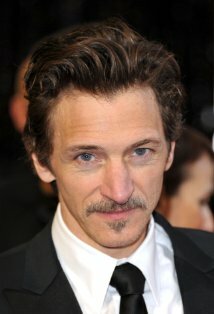 John Hawkes (Deadwood, Winter's Bone) and Yaslin Bey (the acclaimed actor and musician formerly known as Mos Def - he changed his name this past September 2011) are already onboard as the ex-cons, Ordell Robbie and Louis Gara. You may be familiar with the Robbie and Gara characters from Elmore's Rum Punch which made it to the screen as Quentin Tarantino's Jackie Brown). Some are calling this a prequel but others nix that so not sure! Dan Schecter wrote the script and will direct as well. So how awful am I? When I saw Dennis Quaid and Jennifer Aniston's names my gut reaction was akin to "Those has-beens?" I KNOW that's terrible but I can't help thinking outside of Horrible Bosses, which wasn't a bomb with critics or audiences and actually did well at the box office, poor Jennifer Aniston hasn't done anything really wonderful in ages, has she?? Has she? And Dennis Quaid? As the reverend in the Footloose remake seems like he's on a sad downward swing. But wait... the more I think about it, the more I think it could be great casting. AND a great boost for both their careers. Jennifer Aniston as a jilted wife who gets payback? Brilliant! It may be ancient history for us but I bet she won't have far to go to find a little bit of left over hatred in her heart from the Brad Pitt/Angelina Jolie love affair that broke up her marriage~! That's method acting at its best. And Dennis Quaid, despite the hackneyed premise, reportedly brought some depth to his Reverend Moore character in Footloose. Thinking back, way back, to the Dennis Quaid I used to love - Something to Talk About, The Big Easy, The Parent Trap, and, at least in this century, The Alamo, In Good Company, I'm rooting for the laid back former ladies man, Quaid, to have something of a comeback. I REALLY hope they keep it grounded in the 70's. With the clothing, hair and historical references, that would make it really fun. Agree? Or not? Who do you see in the key roles?